Excellence is never achieved in a day. Excellence has a preface. A preface, no less than a saga made up of extraordinary events, real life heroes and a foundation ornamented with valour, initiative, sacrifice and faith. A foundation, so deep rooted and concrete, which creates edifices emitting values, knowledge, thoughts to the society at large and a character to its inhabitants. That excellence is what Goswami Ganesh Dutta Sanatan Dharam College has achieved in its thirty seven years of existence. Right from its very inception, the college was fortunate to have been led by eminent stalwarts. Inspired by the spirit of service and sacrifice, the institution was incepted on 3rd July, 1973 in the revered memory of Goswami Ganesh Dutta Ji, who envisioned Chandigarh as a focal point of culture and saw it as a potential hub for Sanatanist activities. His dream materialized under the dynamic leadership of late Pt. Mohan Lal Ji, former Education, Home and Finance Minister, Punjab, and other eminent educationists, prominent lawyers and public men. With the efforts and collaboration of such profound workers, a first rate college was established, firmly grounded on the bricks of principles and values, proudly telling the world about its very character in its motto 'Firm in Faith and Broad in Mind'. The teething troubles of the institution were overcome by the 'karmayogi' Pt. Mohan Lal Ji, who, with his pragmatism, vision, administrative acumen and exceptional enthusiasm led the institution from the front. Panditji was joined in his untiring efforts by the luminary Prof. Roshan Lal Verma Ji, the founder principal of the college, who donated his entire life's savings in setting up this institution. Right alongside was his wife Ms. Kaushalaya Devi Verma Ji who too, selflessly bequeathed her entire property to the college. The assets that she donated to the institute were later used to form a trust which helps provide support to the women of the economically weaker sections by providing them excellent career oriented courses and training facilities, absolutely free of cost. Since then, the college has been imparting holistic education to the future torchbearers of the country. The principals of the college have dedicatedly striven towards continuing with this saga of excellence that passed down as heritage from its founding stalwarts. Sh. D. N. Sharma served as a regular principal from 1975 to 1990. Then the principalship’s torch was handed over to Sh. Umesh Chandra Sharma, who guided the college from July 1990 to July 1995. Dr.A.C Vaid, Head of the dept of Economics took charge as Principal in 1995 and under his laudable leadership, the college attained immense progress and received distinctions like ‘A College with Potential for Excellence’ by UGC and ‘Star College in Life Sciences’ by DBT, Govt of India. He was elevated as Pro-Vice Chancellor of Apeejay Stya University, Gurgaon in 2011. Mrs Meena Prabhakar took charge as the officiating Principal in July 2011 and carried out her duties with ease and proficiency. 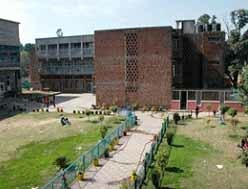 Dr Bhushan K. Sharma took over as Principal of the college on 25 Jan 2013. As a brilliant academician, an excellent administrator and a great visionary, Dr Bhushan K.Sharma has chalked out extensive plans and strategies to bring the institution on the national map of India. Mrs. Raj Kumari Chadha was a source of strength, passion, and love to her family. It was this this faith which gave her the strength to flee her homeland of Hazara (now in Pakistan) during the partition, with her husband and young child. It was this faith which allowed her to endure the hardships of settling in a new land, supporting her husband in his new endeavors, and caring for her growing family. Although she did not receive a formal education, Mrs. Raj Kumari Chadha excelled at adapting to change and learning from her life experiences, even managing to teach herself to read and write English at 50. She became a dedicated and notable figure in Sanatan Dharam Temple in Sectors 28, 27, & 26 at Chandigarh. She was always willing to share knowledge of her faith with others. It is, therefore, fitting that her name now graces the hostels and auditorium of a college dedicated to education and success. Mrs. Raj Kumari Chadha’s life is a reminder to her family, and hopefully to the students at Sanatan Dharam College, that education is what happens when we take life's challenges and use them as an opportunity for self-improvement.